I would go with the Sienna hands-down. Between gas, repair and maintenance, and depreciation savings, it's probably a couple thousand dollars cheaper per year to own and operate than the other vehicles you mention for the same priced vehicle. 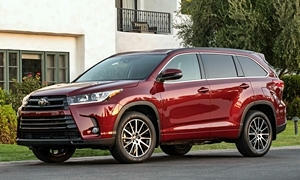 If you want something more in the SUV mold, you could look at a Honda Pilot or Toyota Highlander. If you don't need off road or heavy towing ability, the minivan wins on almost every issue over a vehicle like the Suburban or Expedition. Lower first cost. Better mileage. Less maintenance. Easier kid hauling (sliding doors are really awesome). Ease of access with low floor. More interior space. Car like handling. Utility - I have gone on cross country road trips with 8 people comfortably in our Odyssey, and also used it to carry 12' lumber or stacks of drywall. Biggest downsides to a minivan are lower ground clearance, lower towing (although decent) and the tend not to have AWD. If you live in an area that gets snow, take a bit of your $15k savings over the Suburban and get a set of snow tires. Snow tires combined with modern stability control pretty much makes up for it. 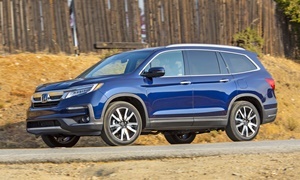 Three row SUV's like the Pilot or Highlander are nice and give you that SUV image that everyone loves, but they simply aren't as practical. Worse mileage, higher cost and less interior space. Back row space isn't great in these and while using the back row, you are left with little luggage space. Consider the Odyssey along with the Sienna. 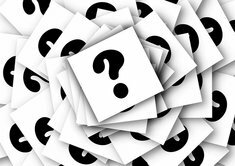 Both are very similar in cost, features and reliability. 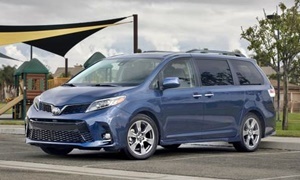 Sienna has a slightly cushier ride, while the Odyssey has slightly sportier handling. Sienna is offered with AWD, but those are rare. 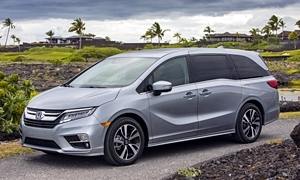 Another interesting factor, Unibody minivans like the Odyssey are safer in crashes than full size body-on-frame SUV's like the Suburban per NHTSA. People think the opposite and feel safer in the larger Suburban because of the huge size, but the feeling isn't fact based. I'm a 40 year old dude and I drove a minivan for 6 years. I agree that there is a stigma, but for me it was offset by the extreme utility. I hauled all kinds of things in the back of that van and I grew to love it for how useful it was. They are also suprisingly quick with strong V6 engines. In the end, the van gave it's life for me as I was in a terrible accident and all 8 airbags deployed when I was t-boned by a car going 60 and pushed into a pole. I had to crawl out of a shattered back window and didn't have a scratch. Wife drives the new Odyssey. Since I "put my time in" driving the van, I was able to leverage it into a new GTI. Good luck! My wife does Ironmans and Triathlons and loves the fact that she can load up the van with 4 bikes, luggage and her ironman buddies and travel to races on the weekends. This is a kind of funny post related to the truck/minivan/image dilemma. The author owns an Odyssey. There is no substitute for a minivan. We own a 2002 Odyssey and it has been through a lot, but it still works. It is so practical. I'd recommend a 2014 Odyssey or newer, but if you need AWD, go for a 2015 Sienna.